This Post IS the Insulator! You don't need to purchase any insulators. Made from recycled PVC, our posts are both strong and flexible making them all but impossible to break under normal use. Timeless Fence® Posts come with a 20 year guarantee and will never rust or rot. Pre-drilled holes every three inches in our non-conductive posts provide an easy alternative to costly and time consuming insulators. You want a fence that will look good and function well for many years with minimal upkeep. A Tpost that is safer than than metal. The Timeless Tpost features a solid, dense core of recycled, semi-rigid polyvinyl chloride, a strong, long-lasting compound that is naturally fire resistant. We guarantee our posts for 20 years, however, they are expected to last 75 years or longer! It's designed to be used with ElectroBriad, WhiteLightning, PolyPlus and Finish Line. Easy to install. We suggest driving a pilot hole with an auger bit in a heavy-duty cordless drill. If rocky soil just simply use a masonary drill bit. Fast and Easy! The length depends on how tall you want your fence to be (above ground). 4'-5' are installed at 12"
5.5' - 6.5' are installed at 18"
7' - 8' are installed at 24"
So for example a 7' post would be 5' above ground. 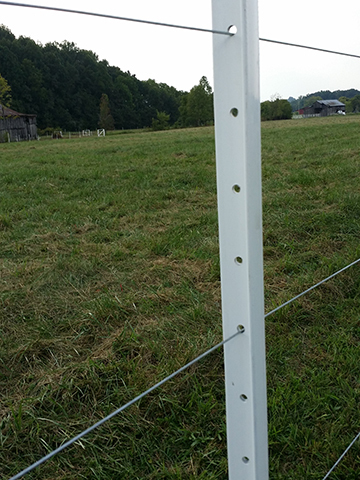 7' posts are most commonly used for Equine use. * There will be a sticker on every post letting you know how far to drive it in. Installation information can be found in the photos above.